Jimi Hendrix was once asked in an interview what it was like to be the greatest guitarist in the world. His answer was, “I don’t know. 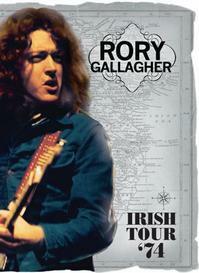 Ask Rory Gallagher.” Watching the performances on this DVD it’s easy to understand why he felt that way. Gallagher was an amazing musician and still a very humble and down to Earth man. While he was a quarter of a century old at the time of the filming, he and his band look much younger. It would be easy to believe they are all teenagers. The thing is, their skill at their instruments is amazing. This DVD is not perfect. The performance bits are scattered throughout with backstage bits in-between. The film picks up in the middle of some of the performances. Still, that was the style of concert film in those days. It would have been nice if the original live footage (assuming it still exists) had been included as one continuous concert film as an extra on the DVD. The real attraction of this release, though, is the fact that there isn’t a lot of live footage of Gallagher. And, he and his band were so incredible that it’s worth seeing. Sure, it’s not a perfect video, but the performances are amazing.